Enjoy a romantic dinning at Dubai marina through a sailing dhow cruise with a totally different view of our beloved ciy. Your driver will pick you up from hotel to drive towards the Yacht club then you continue to the Marina Dubai where you will go on board your cruise and start your cruising trip at the marina. Enjoy your fabulous soiree on the background of classical music with marvelous views of palm island, pleasure continues with nice and delicious dishes served by cruise staff and from different cuisines of Arabian, western and Indian cultures. By the end of your cruising tip, you will find your diver waiting for you and ready to go back to hotel for overnight. DLM offers an intriguingly different view of this amazing city - a portrait of the new character of Dubai and the 8th wonder of the world, The Palm Island. 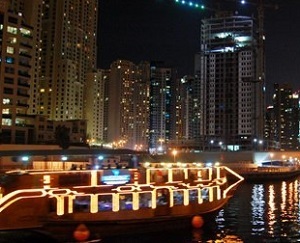 The Dhow is located at the west side of Dubai Marina Yacht Club. After departing from Dubai Marina Yacht Club, we will be cruising at the Dubai Marina channel with Dubai Marina on one side and the Jumeirah Beach Residence's on the other side. You will have amazing views of all the attractions and landmarks in that area. Then, we will enter the Palm Island where you will be able to see the buildings and villas of The Palm Island as well as the Atlantis Hotel on one side and the beach resorts on other. The Burj Al Arab Hotel will also be visible across The Palm.